As my baby son suffers from a mild case of dry skin, we need to ensure the environment in his nursery is always at optimum levels. The main factor that I need to monitor and control is the humidity. That’s where the Aeon Labs Aeotec Multisensor 6 comes in. You can use the Multisensor 6 with any Z-Wave hub such as my favourite the Vera Plus or the Samsung SmartThings hub. I already use the Fibaro Sensor for my living room but it lacks the one sensor type I need for the nursery – humidity. So I looked around and found the Aeotec Multisensor 6 which is the successor of the Aeotec Multisensor 5. Compared to the previous version, the Multisensor 6 is 70% smaller and 50% lighter at 2.6 oz. In case you were wondering, the Gen 5 in the sensor’s model name refers to the Gen 5 Z-Wave standard it works on. The Multisensor 6 has a conventional cuboid form which makes it easy to place on flat surfaces. 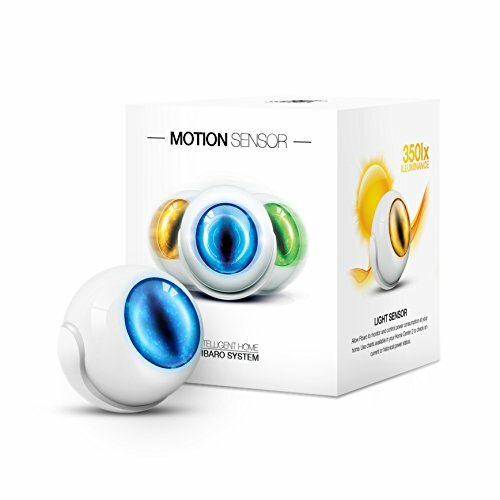 This was one thing that bugged me about the Fibaro motion sensor which likes to keep rolling about because of its spherical shape. Aeon Labs has made the sensor very compact and is just a bit larger than a CR123A battery as can be seen below. On the front face, we find the very traditional-looking PIR sensor cover and just two other components – the lux sensor and an indicator LED which flashes green whenever motion is detected. On the back side, the battery cover reveals a cover lock slider, the back-arm mount hole, a Z-Wave Action button, and some technical information about the multisensor. Taking the battery over off reveals the battery compartment that takes the two CR123A batteries (not supplied), the microUSB port and the rest of the Z-Wave Action button. While the Fibaro motion sensor could be powered only by batteries, the Aeotec Multisensor 6 can use either batteries or the supplied USB cable for power. The advantage of USB power is that you can get real-time sensor data instead of once every few minutes with the batteries. The Z-Wave Action button is a multifunction button that can be used to put the sensor into network inclusion mode (adding the sensor to your Z-Wave network), exclusion mode (removing the sensor from your Z-Wave network), enable/disable the 10 wake-up mode, and reset it to factory defaults. I first put my Vera Plus Z-Wave hub into ‘add device’ mode and then put the multisensor into inclusion mode by pressing the action button once. Immediately the Vera Plus detected the Multisensor and added the various sensors to the Vera dashboard. Let’s look at the various sensors and how they performed in my home Z-Wave network. 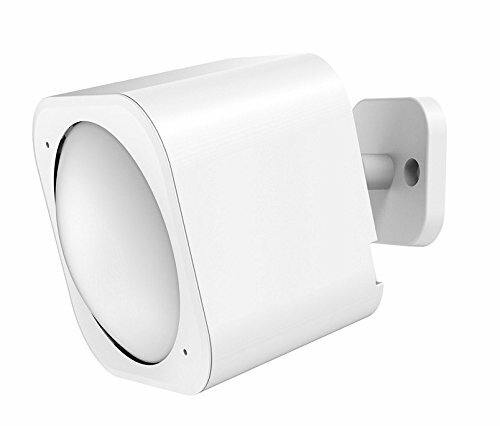 The claimed motion detection range of the Multisensor 6 is 120 degrees horizontally with a 5 metres range. I have placed the sensor on the chest of drawers in the nursery and it does indeed have good coverage and a range of at least 5 metres. It is sensitive, reacts instantaneously to motion and has never missed a motion event. By default, the sensitivity setting is set to the maximum sensitivity value of 5. You can also control the time gap between sensor activations by using Setting Parameter 3 [2 byte]. For example if you set the value to 10, the PIR sensor timeout will become 10 seconds – so for 10 seconds after detecting motion it will ignore all further motion. After that, it will then again be ready to detect motion. These two settings can be used to control and reduce false motion alerts. I compared the temperature sensor’s readings to the Fibaro’s putting both sensors side by side. The two devices agreed within 0.1% of each other which was quite reassuring. When the temperature in the room changes slightly, I noticed that by default the sensor reports it only once every 10 minutes or so. However when there were larger variations in temperature, the Multisensor seemed to inform the Vera Plus quickly – I am happy with this behaviour. The light level sensors and humidity sensors work very well. According to Aeon Labs, the MultiSensor 6 comes with a digital light sensor that’s capable of sensing lighting between 0 lux to 30000 lux in real-time. I used the excellent advanced scene control plugin PLEG to create a scene based on the reported humidity level. Whenever the humidity level as reported by the Multisensor goes above 65%, the Vera Plus switches off my humidifier connected to a Greenwave Z-Wave power plug. This way the room does not get too damp. My Vera Plus firmware did not support these two sensors at the time of writing this article. But as is usually the case, Vera is quick to support new Z-Wave devices and the UV sensor support has already been added in UI7 firmware version 7.0.15. While the Fibaro needs only 1 CR123A battery and has only 1 battery slot, the Aeotec’s battery compartment has two battery compartments. Interestingly the sensor will work off just one battery, but having two of them will double the battery life. One niggle I observed was that the sensor initially showed the battery status as 50%, even though the batteries were brand new. 4 months in, the battery level is at 47%. So absolute battery consumption seems to be fine but the battery gauge seems to be a bit off. Now this could be down to the specific batteries I use with the device. The Multisensor 6 has very strong wireless range and was able to stay in touch with the Z-Wave network wherever I took it in the house. I love the Aeon Labs Aeotec Multisensor 6 and highly recommend it. It has every sensor you will ever need to monitor the environment in your house. This multi-talented Z-Wave multisensor may be a bit pricey but there's nothing like it on the market. World's smallest z-wave Multi-sensor detects motion, temperature, light and vibrations due to built-in accelerometer. Only 1 ¾" in diameter.